KISS By Monster Mini Golf, a unique rock n' roll themed amusement attraction based around the world renowned band KISS, is coming to Las Vegas, NV. Scheduled to open in January 2012, KISS By Monster Mini Golf is the first of its kind and will include an indoor glow-in-the-dark custom-designed, rockin' 18-hole miniature golf course, a state-of-the-art arcade, the largest KISS gift shop in the world, a KISS gallery, ‘Hotter Than Hell’ Wedding Chapel, a private VIP Room, FANtastic KISS themed event rooms and the ‘Rock N’ Roll All Nite’ Cafe. A live DJ will rock the house, throughout the days and many Crazy, Crazy Nights with continuous KISS music, trivia, contests and prizes, creating a place embraced by locals, tourists, and rockers of all ages. To commemorate the launching of the first KISS By Monster Mini Golf, fans have an opportunity to become immortalized as part of the decor. The KISS Fan Paper will be created with photos sent in by KISS fans doing what they do best, showing off their KISS. The walls of the venue will be adorned with KISS admirers and will take on a new meaning for the "place to be seen." Pricing starting at only $20 will determine placement and size. 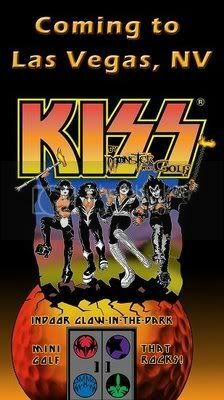 To learn how to become immortalized "Forever" log on to MonsterMiniGolf.com/KISS. Monster Mini Golf was founded in 2004 by visionary, Christina Vitagliano who had "great expectations" to create an enjoyable and affordable amusement facility. Her inspiration expanded to over 30 themed miniature golf courses across the country, where "unmasked" monsters with lively personalities are par for the course. Her imagination caught the attention of Gene Simmons and Paul Stanley and KISS By Monster Mini Golf was born. Live Nation merchandise, the exclusive worldwide merchandise and licensing agent for KISS, brokered this KISS By Monster Mini Golf deal. Monster Mini Golf founder, Christina Vitagliano commented: "Introducing the first-ever KISS By Monster Mini Golf to Las Vegas is an amazing opportunity for us as we expand our Monster Mini Golf creation. It is also a great honor to work with KISS, who are personal favorites of mine. I am confident we are creating a venue that will become a must see attraction in Las Vegas." KISS By Monster Mini Golf is located across from the Hard Rock Hotel and Casino at the Shoppes at Harmon Square.